It's a little-known fact that I once took a graduate course in the Ancient Sumerian language. It was all part of my general interest in obscure and difficult languages, which continues unabated to this day. I had to memorize archaic hieroglyphs, cuneiform logographs and vocabulary meanings, not to mention the bizarre Sumerian grammar (the agglutinative nature of which I am sometimes reminded of when I look at Korean). I don't remember much of it - Sumerian is just not something one has much occasion to use. Above right is an image of the archaic style (c. 3000 BC) I mostly focused on in my class but it's utterly unrelated to the quoted proverb. Below, likewise unrelated, is an image of the later, more refined style of the civilization at its height (c. 2000 BC - and note that the refined style below is just as likely to be Akkadian as Sumerian - the civilization was bilingual and used the same writing system for both languages, which were linguistically unrelated - actually, that's similar to the situation between Korean and Chinese in the pre-modern era). It's a few days late, but I just now ran across it. Warning: if you are unfamiliar with Burroughs, be forewarned - you might want to reconsider listening to his "prayer" (which is not a musical track, either, by the way - this is poetry being read by the author). Burroughs was a great American writer in my humble opinion - one of the greatest - but he was undeniably deeply profane and gallingly liberal (or perhaps more correctly he was a type of libertarian - he was pro-drug but also radically pro-gun, for example, and though he despised "lawmen" he didn't seem to have much of a problem with big government in principle). His iconoclasm comes across plenty clearly in this short bit. William S. Burroughs, "A Thanksgiving Prayer." Thanksgiving Day, November 28th, 1986. Thanks for a country where nobody is allowed to mind his own business. Yes, thanks for all the memories - all right let's see your arms! Burroughs, as a writer, was perhaps one of the single most influential in my life, though you wouldn't know that by looking at my lifestyle or my other tastes and interests. I am the junkie-that-never-was. My feelings of tweegret have overcome me, despite my long, strong efforts to resist it. So I have become a twit - which is by far the best noun coined for those who tweet, using twitter. But rather than give in to a phenomenon that seems so banal and narcissistic as to render even facebookland a veritable utopia of social altruism, I have decided to "double down." I will only post tweets 14 characters in length or fewer. Note that this does not include links or hashtags. Originally, I thought to make my rule a limit of posts to one word. But I decided that to better double down on the original 140 character limit, a 14 character limit was more elegant. I would like to observe that in a unicoded, character-per-syllable language with essentially optional spacing between words, like Korean, 14 characters is still quite sufficient to post entire sentences. English, with its relatively low information density (on a per character basis), is more limited, and the restriction will lead to a certain absurdism. I hope. My username is @waejeorae (which is based on my joke "Korean Name" 왜저래 [waejeorae = what the...? , what's up?] - because the pronunciation resembles that of my true name in Korean order: Way Jared). If you follow me, I promise to be disappointing. As this late adoption of the now ubiquitous twitter platform shows, I am not really an "early adopter." I certainly have been an early adopter in some realms: I wrote all my papers in high school on computer (1979~1983), I programmed my first spreadsheet app in 1986, I bought my first laptop PC in 1992, I published my first website (that people - namely, my students - actually visited) in 1995 (on geocities - remember that? ), and this here blog thingy was started well ahead of the technology adoption curve in 2004. But I've been quite late in other areas: I only bought my first cell phone in 2004, and only got my first smartphone last year. And here I am joining twitter only past their IPO (which is a well-established signal of outright decline in the technology world). So whether I adopt some technology or not is largely connected with my perception of its usefulness, rather than some desire or interest in adopting new technologies for the sheer sake of being at the vanguard. In my opinion, an across-the-board failure of antibiotics is much scarier than global warming. I was struck by the observation that if antibiotics stop working, things like my cancer surgery become nearly impossible, too - consider that without antibiotics, my post-surgery infection would have possibly been fatal. So when we sit and worry about the future of the world, let's worry about this rather than global warming, which seems much more "survivable" to my perception. and cranberry jelly–”esa mierda roja,” he called it. I like this poem much better than the blandly abominable poem Blanco wrote for Obama's second inaugural. Celia Cruz, "Oye Como Va."
This article is why, although I love teaching and at this point consider it my career, I probably will never be a classroom teacher in my home country. That's not to say I don't face these kinds of issues in Korea, but being a "foreign" teacher here insulates us from some of the administrative "BS" regular teachers face, and, undeniably, it insulates us, too, from some of the (poorly targeted) responsibility that gets heaped on the typical homeroom (i.e. locally-native-speaking) teacher. I like the term "Education Malpractice" as used in the article. I don't claim it isn't a problem, here in South Korea, as well, but here, unlike when I was teaching in the US, I get to sit in my privileged position as a foreigner and look the other way with respect to a great deal of it. Our hagwon lost two students between Monday and today that impacted me more than most of our recent losses. They were both "high maintenance" students, but in both cases I'd had personally put such a great deal of time and energy into them. Really, a "high-maintenance" student, in this context, means a high-maintenance parent (i.e. the paying customer). Both of them had very difficult, demanding moms. So in a sense, in both cases, we (meaning not me but the home-teacher involved) essentially said, "ok, enough is enough," and let the students move on. At one level, this is exactly what I advocate for in my IIRTHW essays - not all customers have the same value, and sometimes it's best to decide a customer isn't worth the trouble (and thus isn't worth the expense in staff members' time and special efforts) to retain. So I feel slightly hypocritical to be upset now that we've bid them good riddance. Except... well, except in these cases I was the one who invested so much of that time and special effort, and I'm suffering what the business school people call the "fallacy of sunk costs" - the almost unresistable desire to throw "good money after bad," or, in this case, to throw more personalized attention and love after already invested personalized attention and love. Even acknowledging this error in my thinking, however, I have another thing that bothers me: although I know that the moms are (and have been) terribly difficult customers, I fundementally liked the students themselves immensely. I'm going to miss them terribly. Both of them were always bright spots in the days when I had them. [One doesn't know] from which cloud the rain will come. This wasn't hard to understand, but I think there is something missing to make this an actual sentence. My grammar "bible" tells me that an ending such as "-ㄹ지" should come in a context such as "V-ㄹ지 모르다" [one doesn't know V will happen]. I think the "doesn't know" is missing but implied here. I didn't know what to call the ending, so I labeled a "future speculative" - I have often struggled with what the "지" really is - it's a kind of a "pre-negative" or subjunctive marker, in my linguistically semi-informed but Koreanically semi-ignorant view. It's a little bit hard to see but there are fat slushy flakes falling... and I hear thunder, standing looking out the front entrance of karmaplus. My friend Peter, who was so generous to me with his time over the summer - even down to spending time with me overnight during my hospital stay in July - is down to his last 24 hours in Korea. I took the 1001 bus over to Bucheon to have an early lunch with him before he rushes off to take care of last minute things and get packed. We had some udon at a Japanese place which is one thing that goes pretty well for me, being bland and soft. 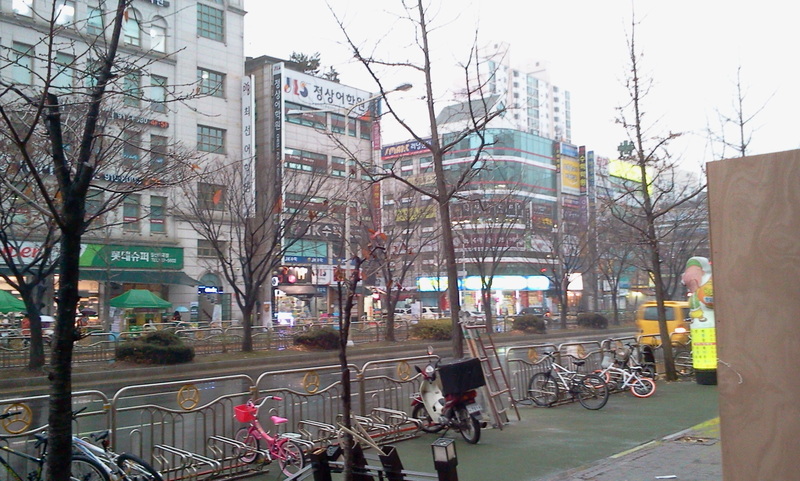 I'm on the bus back to Ilsan now and will go to work a bit early. I wish Peter safe travels and good luck on his next endeavor, whatever it may turn out to be. Blade Runner is a remarkable movie, and struck me as such the first time I saw it, which is was probably near when it first came out when I was still in high school. Now, someone with far too much time on his hands has created a tribute to that movie: by painting a frame-by-frame recreation of about 30 minutes of the movie using watercolors, he's then run it together using stop-motion animation and matched it to the original soundtrack. Although I really like this creation, and I really like Blade Runner, my question is this: why couldn't he have applied such prodigious talent to something original? My doodle-du-jour: a girl cavorting in a tree with small aliens. I'm not sure what the story is behind this, exactly. But there's definitely some kind of story. When I got home from work after my Saturday morning classes, I was eating something and had made coffee to drink. I knocked over the coffee cup by accident, and poured an entire cup of coffee on my keyboard, my mouse, my cellphone, and other gadgets. So I took it as a sign. I unplugged everything, turned everything off, cleaned everything, and decided to go low-tech for the rest of the day. I think my keyboard is dry now. OK, I had a rather unpleasant epiphany the other day: what if I need to take my doctor's remarks of a month ago - that it may be 3 to 5 years for things to get back to normal - more seriously? What if, in fact, that's how long he meant even for me to be able to eat normally? That this frustrating, unpleasant eating experience is, in fact, a new normal? Maybe I should shop for some of those disgusting protein shakes that manic dieters consume, and be done with "eating" as a habit altogether. Or something. MC 900 Ft Jesus, "But If You Go." With the start of November, I've been starting a new habit in some elementary classes. When I write their names on the board (which is a long-standing habit of mine, as I have found that keeping track of how students are doing "publicly" is a great motivator and encourages students to pay attention), I now accompany their names with a "character." This is mostly for entertainment value, but sometimes we have little conversations about them too. I have big plans for these characters, eventually, but for now they're just in a sort of beta. But they're cute and fun to draw, and it doesn't really take that long - I do it when the kids are doing a vocab quiz or digging out their homework at the beginning of class. Seizing for the head and instead catching the tail. According to the book, this means something like "big ambition, small success." I feel like this could be a title for my autobiography. Yesterday, Wednesday, I had a lot of CC classes with the elementary kids. We play pop songs and the kids try to understand the lyrics and sing along - there's software that's pretty well designed to support this. Of course, the hardware resources (laptops and projectors) at the hagwon are always half-broken and still make this kind of technology-oriented class a challenge for us. But, well... it works out. Mostly the pop songs are pretty recent: Adele or Katy Perry or whatever. But sometimes it seems like these really old ones appear. I was confronted with trying to present the Bee Gees "How Deep Is Your Love" to a group of 4th and 5th graders. Students screamed and wailed in horrified protest. It was qualified immediately as "Old!" Also, "느끼!" [neukki = greasy, sleazy, cheesy]. And finally, "Teacher! Too much hair!" Bee Gees, "How Deep Is Your Love." Speaking of too much hair, I got a similar comment from a middle school student who goes by Pablo last week, when I happened to show him a very, very old photo of me that my brother had sent to me in my little care package. I'm pretty sure that is me and my brother near Minnehaha Falls in Minneapolis in the early 90's - I'm almost positive that's when it was. Pablo gazed at the picture, and said, "Is that you?" Then he said, "Wow. Teacher, you had so much hair!" And then Pablo said, reflectively, looking me up and down now, "Time is powerful." I haven't been sleeping well. I sleep for an hour or two, then wake up. My mouth gets dry, my bladder seems small. I try to go back to sleep and mostly I succeed, but last night I was awake for about an hour. I was reading my Chinese philosophy book, about the guy called Mo Tzu, who came between Confucius and Mencius who are the two I already knew about, in around 400 BC. According to the book I'm reading, on the one hand he was focused on "universal love" and on the other, he was a committed authoritarian and believer in spirits. I went to sleep and dreamed I met Mo Tzu, except he was dressed like Don Quixote and was wandering around ancient China. I think this happened because the author I'm reading referred to Mo Tzu's social class as "knights errant" - essentially mercenaries who went around renting their services to sovereigns. Mo Tzu Quixote was accompanied by a cartoon-character Sancho Panza sidekick, and was reading to a crowd of Chinese peasants from the King James Bible. Where did that come from? The peasants were enthralled but then some wise man came with some soldiers and told the crowd to disperse. I was sitting under a tree having given up trying to follow Mo Tzu. There was a line of ants walking, and I followed it, only to realize they were marching in a circle around the base of the tree. I collapsed in annoyance and disgust. The sun was setting, and it was cold. I woke up again, feeling cold, my mouth dry as flour. 4 am. A while ago I posted about the fad song circulating online by Ylvis, "What Does the Fox Say?" It's a funny and entertaining song. Now the parodies and imitations have begun. This is a China-bashing parody out of Taiwan. Also funny, in a different way. Related to the "Fox" song, I also ran across this meme-image. Today was a pretty bad day. I went to work early. There was a two-hour meeting about new curriculum. This type of meeting is frustrating for me, because a great deal is being said that I have no doubt I'm interested in, but because it's Korean I often only get the gist of something, or it takes me too long to realize what's being said for me to be able to provide timely input to a conversation. Mostly decisions get made and I am merely witness to the process, which is better than not being included, but still more frustrating than a strongly opinionated individual such as myself might prefer. Then I had some classes to teach. I have a lot of classes to teach, these days - I'm back to full-time. I teach 26 per week, I think. Each day, I struggle to stay positive and focused and provide effective teaching. Yet my tongue and mouth have a limited ability to remain coherent after hours of talking. I'm often just plain physically tired feeling, too. It doesn't help that I'm constantly hungry, yet I avoid eating because it's painful. Today I threw away part of my lunch (some rice twice-cooked with water - homemade juk) because it was taking me too long to eat and I needed to get ready for work. So I was so hungry my back and gut ached, but I wasn't willing to do anything about it. Just work through it. I thought after two months after the end of radiation, I'd be beyond still eating like an infant and feeling pain with each bite. There was a hweh-shik (회식 = work dinner) after work and everyone was pressuring me to go, and I just said no, no, no: a) it's not fun for me to watch other people eat and drink; b) I'm exhausted; c) I'm not feeling celebratory after an 11 hour day. I do better in moments of crisis. My whole summer was crisis. This isn't crisis, this is just life - with the added discomfort of a messed-up mouth and tongue. I'm sick of it: it's just a long never-ending battle with my shortcomings (linguistic in several senses of the word) and discomfort. My current book-in-progress-in-which-I'm-actually-making-progress is an introductory book on Chinese philosophy by Fung Yu-Lan. I've never really tackled Chinese philosophy before - it's a major lacuna in my philosophical education, which is more extensive in Western, Native American and Indian (i.e. South Asian) philosophical traditions. Obviously, an introduction to Chinese philosophy starts, more or less, with Confucius. The core principal is apparently called "jen" (via Wade-Giles, used by Fung). The book doesn't provide characters, which I'm actually interested in knowing, so I did a little bit of research, to tie things together. I also tried to find out the Korean readings of the characters in question, as that interests me too. The key principal of all of Confucius' thought is human-heartedness, or jen (仁, pinyin [ren], Korean 인 glossed as 어질다 [benevolent, virtuous] in a hanja dictionary). Jen is in turn divided into a "positive" and "negative" aspect, each of which is a sort of corollary of Westerndom's "Golden Rule": conscientiousness toward others or loyalty, chung (忠, pinyin [zhong], Korean 충 glossed as 충성 [loyalty]), which really means "Do unto others as you would have them do unto you," and altruism or reciprocity, shu (恕, pinyin [shu]?, Korean 서 glossed as 용서 [pardon, mercy]), which really means "Don't do unto others what you would not have them do unto you." Then one of Confucius' students, Tseng Tzu, summarizes: "Our master's teaching consists of the principle of chung and shu, and that is all" (Analects, VII). As I walked to work, today, it started to snow. It didn't stick at all - the ground was too warm, still, I think - but it was a good effort at snow. Ever since plunging into my new, returned-to-full-time schedule I've been feeling exhausted. I guess I knew that would happen, and at one level, I welcome it. But it's making it hard to keep up with other things - like, for example, thinking of something creative to put in this here blog thingy. I was surfing a site called Twisted Sifter and found this map. According to the caption, it shows "Map of Where 29,000 Rubber Duckies Made Landfall After Falling off a Cargo Ship in the Middle of the Pacific Ocean." This is need-to-know information. Or interesting, anyway. I ran across a different version of this quote, but decided I liked my own version better. Sometimes I wrestle with my demons. Sometimes, we just hold hands and sit together in silence. Yesterday the two TEPS반 refugee boys (by which I mean a cohort that once had 10 students is reduced to only two) were reduced further to just Jaehwan. Hyeonguk, the other student, had disappeared, and we couldn't find him. The front-desk-lady didn't know where he was. He'd simply disappeared. We worked our way through the questions, and shared some joking remarks about how when Hyeonguk showed up, he'd have a lot of homework piled up (since the rule I have for this class is that the dictation homework is waived for questions with correct on-the-spot answers in class, and since he wasn't around, obviously none of the homework was waived). I speculated that Hyeonguk may have been abducted by aliens. I had to explain this by drawing a picture (at right), since Jaehwan was unfamiliar with the pop-culture-referencing idiom "abducted by aliens." Then about 20 minutes in, Curt reported in to say that Hyeonguk had been located - in the next-door classroom, where he'd decided to "audit" without telling anyone. I'm fine with that - these things happen. Jaehwan and I shared a laugh about it, since we'd really had no idea where he'd gone. He knows I study Korean aphorisms, sometimes, so he took the opportunity to tell me one relevant to the situation. It's dark at the base of the lamp. The English expression might be, "right under one's nose." I wrote it on the board, to be able to remember it. There was something expansive in my illness. It forced me to open out into the world and confront things head on. Guilt and self-recrimination evaporated - there was no time for it. I took on the world, drew it into myself, embraced it. This last month has felt like a sort of contraction - a narrowing, a closing-in upon myself. And there has been a resumption of guilt and self-recrimination. It all seems to run like a stop-motion movie of a flower growing, opening, then wilting and dying and falling away. Cancer flower. Seasons for the wrong reasons: spring becomes fall, through a summer of desperation. Yet from a standpoint of my simple physicality, doesn't it seem like the effect should be opposite? Shouldn't I have plunged into a temporary field of decrescence only to rise out and emerge whole again afterward? The psychology of this thing has me puzzled. I have indeed been in a very strange mental place, this afternoon. I've been listening to classical music continuously. I guess what's called "contemporary classical": John Tavener, Arvo Pärt. Bobmusic, I have called it in the past. When is the last time I did that? Many, many years. Some guy is posting his journal entries from the 1970s when he was a kid. That seems like something I would do... if I had had a coherent journal when I was a kid. I mostly just drew things on loose-leaf paper. I still have all those drawings - or most of them - but they are undated and disorganized and in boxes in Eagan right now. If ten years pass, even the mountains and streams change. I took this picture in September of 2010 at Mudeung Mountain (무등산) near Gwangju. I slept longer than I have in a long time - I woke up about two hours later than my usual time. That's a sign that I was tired yesterday. I was having strange dreams about drawing monsters. Cartoon monsters. Not much plot. Just drawing cartoon monsters. Some dream. I tried to draw one of the cute monsters I'd been dreamdrawing immediately when I woke up (see right). Success: marginal. When I arrived at work today, I saw that I had received a care package from my brother. It is, by far the most eccentric (and therefore best) care package I've ever received. It included finger puppets (from his girlfriend Hollye), which will be perfect for my lower grades roleplay classes. It included various random packages of unusual flavors of tea and coffee. It included what appears to be a late 1800's edition of Longfellow's poetry (it's undated, like many books from the pre-modern era). It contained some hand-burned CDs of music (some of which were damaged, making me think maybe my brother found them on the floor of the garage or somewhere like that). It contained a robot magnet. And it contained a panic button - literally: a button that looked detached from some device, with the word "PANIC" inscribed on it. Oh, and it had some iodine supplements - which I'd asked for, having been unable to find them in Korea, and theorizing that iodine might be part of what might help my post-cancer resistance to further cancer go well. My brother knows me well. Work was intense today. I had 6 classes, all in a row. And every single one of them was "new" - not the kids, but the curriculum spots were all inherited from other teachers, as we got new schedules this week and I have finally become truly "full time" again. With every class being new, I was hardly well-prepared. But I knew the kids, anyway, and considering everything, it went pretty smoothly. It's the most intense, full teaching day I've had since before my hospitalization. Walking home, my mp3 shuffle seemed fixated on playing only sad and depressing songs. But I didn't fast forward through them, I just listened. Not really feeling that sad or depressed at the moment. Just tired.